Angel Locsin taking time posing for her fans. Angel Locsin will be appearing in the Maalaala Mo Kaya episode this weekend valentine presentation. Angel Locsin will play as an accidental mistress to Jake Cuenca. Gotta watch Angel Locsin in a different role. Don't miss it. Another hot Pinay Celebrity included in the Bench's "Lost in Summer" Ad Campaign is Shaina Magdayao. I've heard that she's now officially out of the picture with John Pratts. I wasn't able to watch Buzz last weekend. It was there where Shaina made the confession with Boy Abunda. Anyone who's got the story, you're free to comment. But for now, let's enjoy Shaina Magdayao in Bench's "Lost in Summer" series like we did with Regine Angeles, Angelica Panganiban and Georgina Wilson. Wait for more, we still have some in the line up. More of Yeng Constantino pictures in my 'baul'. Gotta share, gotta share. Angelica Panganiban plays Rubi in the newest telenovela "Rubi" on Kapamilya network . 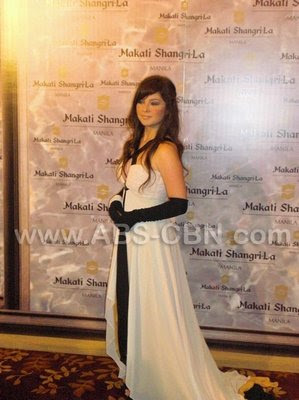 Looking at these Angelica Panganiban photos, I can' t help but admire at how classy she looks like. Very prim and intimidating. Lucky Derek. Here's an excerpt from the official site. Angelica Panganiban as Rubi Delgado - Rubi is the type who will do whatever it takes in order to be rich and famous. For that to happen, she befriends an unsuspecting classmate who comes from a well-off family and uses that connection to achieve her evil schemes. What happens though when she discovers that the good life she has always dreamt of is not as rewarding as being with the person who truly owns her heart? My ultimate crush in showbiz today, her hotness Regine Angeles in Bench "Lost in Summer" Ad Campaign. I wonder what's the latest with Regine Angeles. I haven't seen her since "Tayong Dalawa" teleserye. I just hope she'll be included again in any ABS-CBN or GMA shows in the near future. If you click on this Regine Angeles in Bench "Lost in Summer" photos link, you'll likely to see the hires version of this photo plus 2 more pictures of Regine Angeles in the same Bench ad. Andi Eigenmann stars in Agua Bendita, the latest telenovela in ABS-CBN which tookover the timeslot of "My Bukas Pa". Surprisingly, its pilot episode debut at 37.7% last February 8 beating Marian Rivera's "Darna" with 27.7% according to TNS TV Ratings. Andi Eigenmann plays as Agua, the twin sister of Bendita (what's the name of that girl ? ), who is partly or mostly water, hehe. Oh well, too much for that. Just check Andi Eigenmann Agua Bendita photos. At the set of cheating hearts with 'the Dream' Cristine Reyes. Also in the pic is Tom of PBB Double Up Edition and Bea Saw, former big winner of PBB. The other one, I'm not sure who is hehe.